We have 6 rooms of varying sizes with shared bathroom facilities. Some overlook the village Piazza with the Alps looming in the distance. Other rooms have partial to full mountain views. 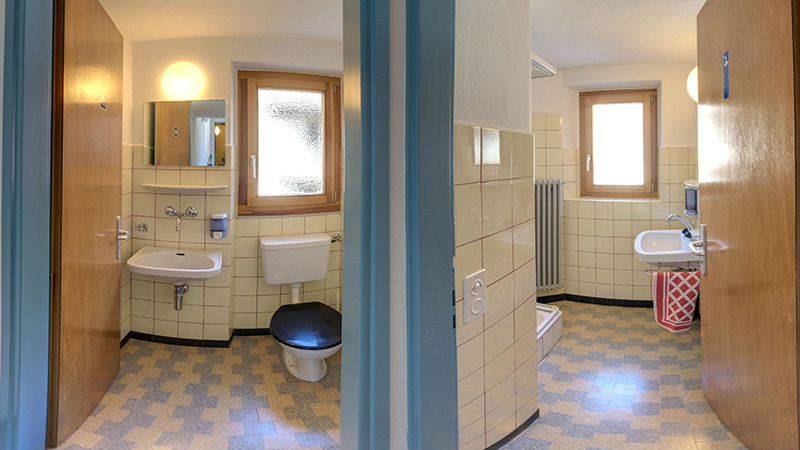 On the 1st floor there are separate rooms for the wc and shower. On the 2nd floor the wc and shower is in 1 room. Some of the rooms have an extra bed which can be extended into 2 single beds to accommodate children. We have 1 baby cot, it is advised to reserve well in advance due to this limited quantity. Very simple and clean furnishings. 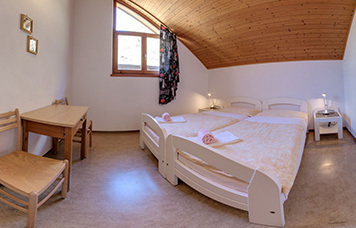 Comfortable beds with fluffy Swiss style single duvets. The rooms each have a closet and some have a desk and side tables. All with towels provided. There are no TV’s. 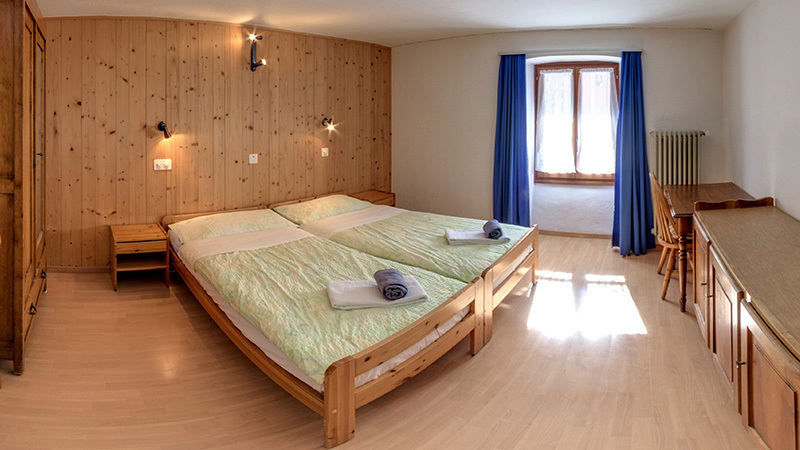 Prices for any room with shared bathroom facilities start at 38 francs per person per night if booking 3 nights or more. 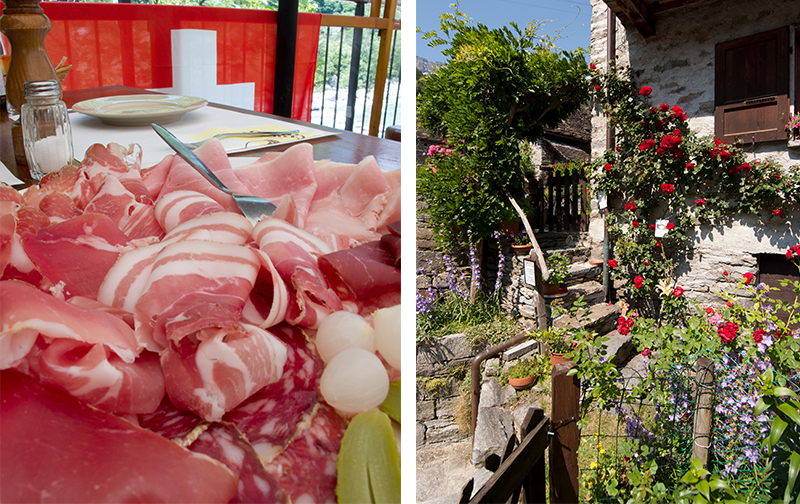 For 1 or 2 nights the price is 45 francs per person per night + additional prices for children. 2 and under are free sharing existing bedding. 3 -12 are 10 francs per night. 13+ years additional bed is 20 francs per night. Please contact us with your reservation requirements to receive an exact price. Please note we are not equipped to handle disabled individuals, all our rooms are located on the 1st and 2nd floor. We do not have an elevator. Dogs are welcome, please note we add a 15 franc fee per dog per stay. This is a cleaning fee. 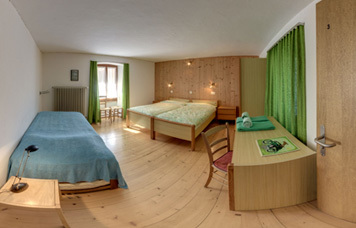 Alpine Style roomsTraditional slanted wooden ceilings furnished in a rustic Alpine style. All rooms with stunning mountain views. *Prices are in Swiss Francs and showing the "starting from" price ... contact us for final pricing. 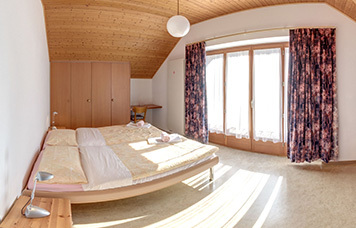 economic rustic roomsSimply furnished rooms providing a clean and comfortable stay for families. 2 single beds side by side with 2 additional single beds available. *Prices are in Swiss Francs and showing the "starting from" price ... contact us for final pricing.